I’m guessing the goat name came from its slight resemblance to the hoof of a goat. Looks like a nice tool to have that would fit a few niche applications, but at $73 I’ll probably never find out. Goats have teeth only in their jaw. They don’t have upper teeth. That could have something to do with the name. I don’t get that part about re-purposing. Alligator wrenches were always for, to quote one patent from 1920, “operating on different sizes of pipes, nuts, bolts, etc.” I’d say the more traditional use was for nuts and bolts, which an alligator wrench turns much more effectively than pipes, especially considering the size of most “pocket” alligator wrenches. In front of me right now I’ve got one of those old Elgin adjustable alligators, about 7 inches long, which I’d hate to know I had to use on a pipe but which still works fairly well turning nuts. Interesting with some possibilities, but $73? Looks like a tool that should be in the $10 range – – maximum! Now I know where the ‘alligator’ pliers came from. Man do I love those. Anyhow, looks like a neat tool, but I can’t think of a use where something I already have, and probably didn’t cost $73, wouldn’t work. Then again, Ridgid wrenches and knipex pliers aren’t all that inexpensive, either. A goat’ll eat anything, is why. 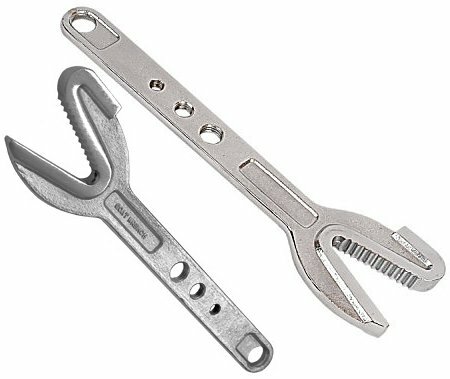 Tractor Supply has an adjustable wrench version of these. Two in a set with 12 pt holes in the handles etc for less than $20.